I am happy to be with you and to learn and experience in this fantastic retro and electronic world. I have just started (I have just been reading and documenting myself to start). I have been trying to do the first project for some time, but without success. I suppose I can ask for help to the veterans. (I hope I can help in a few years too). I think the programming part is fine, but something is not right from the pinout welding part. I've used all the ones I've found in the forum for PRG 128k and CHR 128k, but I think most are meant for NES versions and I guess it's different in Famicom. Thank everyone and hope to be part of your community. PD- Forgive my terrible English. Last edited by doragon on Thu Oct 05, 2017 1:02 pm, edited 1 time in total. 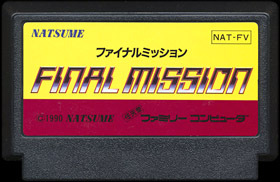 Post subject: Re: Final Mission - Is famicom the same as in NES? Take a look on the ROM pinout using as base the MMC1. I saw some Famicom cartridges that used standard ROM pinout. I keep researching and testing from time to time. I'll take a look at what you're saying. Thank you very much for your help.